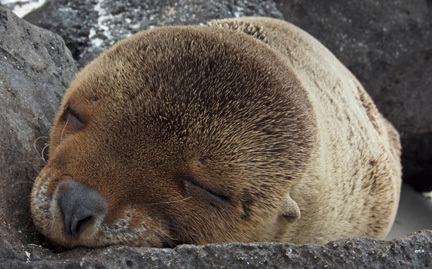 Galapagos sea lions inhabit coastal waters of temperate to sub-polar regions of both the northern and southern hemispheres. Their strong front flippers make them agile on land as well as in the water. Social animals, sea lions live in colonies of up to several hundred individuals. A bull male defends the colony’s territory; younger males without territory congregate in “bachelor colonies.” Sea lions are threatened by entanglement in long-lines, nets and other fishing equipment.